The desktop Tempescope mimics storms and lightning by flashing, dripping, and fogging. To check tomorrow’s weather, you could open an app or turn on the local news. For something less boring, you could also consult a Tempescope, a caged atmosphere that simulates looming clouds, thunderstorms, and pouring rain. Tokyo-based software engineer Ken Kawamoto dreamed up this strange artifact a couple years ago after visiting the Mariana Islands and thinking “how great it would be if he could just take the skies home with him,” according to a new Indiegogo campaign. His first prototype was crafted from shampoo bottles. 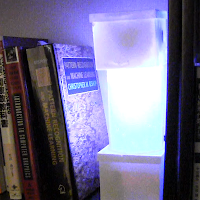 With the help an LED, an ultrasonic diffuser, and water and air pumps, it could whip up sunrises and tiny storms on his bookshelf. Introducing the tempescope… [a] physical display that reproduces various weather conditions according to the weather forecast. It’s like having a window that lets you look outside at tomorrow’s sky. With a tempescope, you don't have to open an app to find out if it’s going to rain today—just take a glance as you leave the house!